A 9-year-old aspiring reporter named Max had his dream come true when he was given the opportunity to interview NASA Administrator Charles Bolden. 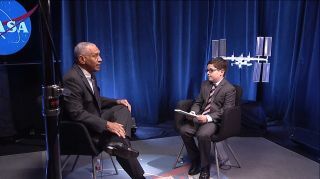 A 9-year-old aspiring reporter saw his big dream come true recently when he interviewed NASA Administrator Charles Bolden. The boy, identified only as Max, was featured on the popular blog "Humans of New York," where he said he'd like to be a reporter like his father, and that he'd like to write about NASA. The agency granted Max his wish and set up the interview with Bolden. You can watch part of the interview here on Space.com. For his interview with the administrator, Max travelled to NASA headquarters in Washington, D.C., armed with a notebook and a sharp-looking suit and tie. He then put his questions to Bolden in front of several television cameras, in a NASA studio. A portion of the interview was uploaded to YouTube. "Let's start with the question I asked on the blog," Max began. "Where are you going to send your next rocket?" "The big destination for us is Mars, sending humans to Mars in the 2030s." Bolden said. "To do that right now, we have a rocket that's called the Space Launch System. We haven't given it another name, so maybe you can help us name it, and it's going to be the largest rocket we've ever built." Riding atop that rocket, Bolden continued, will be a spacecraft called Orion that has been tested just once in space (without humans), last year. The goal is to test both systems together sometime between 2018 and 2020, Bolden added. Meanwhile, human spaceflights are evolving as two companies, Boeing and SpaceX, offer vehicles for the commercial crew program that could fly as early as 2017, he said. Max also asked what NASA would accomplish in his lifetime. Bolden said he couldn't make predictions that far ahead, but made some suggestions for what would be possible when Max is 30 — roughly the same age Bolden was when he successfully applied to be an astronaut. "My hope is we will have migrated NASA astronauts out of low Earth orbit. We will operate routinely around the moon again," Bolden said. "We'll be in what we call our 'proving ground' for going on to Mars, and we'll be right on the verge of sending humans to the Martian environment for the very first time." Bolden further suggested that Max should try applying for an astronaut job, because then the boy could be on the first human mission to Mars. Follow Elizabeth Howell @howellspace. Follow Space.com @Spacedotcom. We're also on Facebook and Google+. Original article on Space.com.